The cost of delivery depends on the destination country and address. *- Standard times of order processing and delivery in working days are listed in the table. Deviations from these times are possible. **- In Germany, the delivery is not carried out to Büsingen. ***- The cost of delivery is increased by the amount specified in the table if the postcode in the destination address is in the range of postcodes listed in the PostCode Table. As a rule, these are postcodes for remote locations or locations difficult to access, or islands. ****- In Italy, the delivery is not carried out to Campione d’Italia, Livigno. The orders processed and confirmed by the Seller, after 100% prepayment by the Buyer, shall be accepted for dispatch and delivery. For the detailed order processing procedure, see here. The average time for processing and confirmation of orders paid immediately after the order checkout is 1-3 hours (during the Seller’s working day). 4. ​If the Buyer’s Order contains goods with different sending (dispatch) times, the sending time for the Order as a whole corresponds to the sending time for goods with the longest sending time. 5. Total delivery time= Processing time + Shipping time. 6. 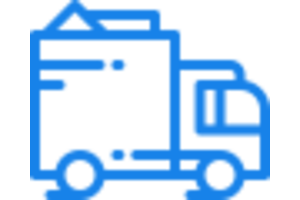 Processing time – its time from placing order until shipping (the time from receiving an order by the Seller until transferring an order to the courier service for delivery). During this time interval, the Seller processes and confirms the Order, prepares the delivery set and hands it over to the courier service. If the Seller confirms an order in a working day before 12.00, the order will be sent the same day; if it is confirmed after 12.00, the next working day. 7. Shipping time means the real time interval from the time when the goods are handed over to a courier to the time when the goods are received by the Buyer. Standard shipping times are listed in the table, and they depend on the destination country. Deviations from these times are possible: in rush periods (national holidays, Christmas) or in case of force majeure (accidents, traffic jams, severe weather conditions) the delivery times may be longer by 1-2 working days. Before the delivery of goods, a courier sends the e-mail to the Buyer to inform about the expected time of delivery. If, due to some reasons, the Buyer cannot accept the goods in time specified in this notification, he/she may contact the courier service operator in the destination country to change the time of delivery; for this purpose, the Buyer must tell the order number (the track number). Before accepting and receiving the goods, you must ensure that the parcel is not damaged and free of visible defects or signs of opening. Receive the delivered goods and confirm the receipt by your signature. Visually inspect the Goods to check its integrity, ensure that it is free of visible damages and defects. You have ensured that the goods are OK and the delivered goods are those that you have demanded in your order? Well, we are glad and thank you for buying from the iPICASSO.CO.UK online store. We wish you to enjoy your goods and look forward for your purchases again! If the parcel is not OK and you have any complaints with regard to the goods (quantity/quality/compliance with the order) or packaging is damaged or opened, or the goods appearance has any damages, immediately ASK the courier to give you the defect report and, with the courier attending this procedure, record all your claims, complaints and drawbacks found. You must sign the claim report with the courier attending this procedure and jointly with him/her! The report signed jointly by the Buyer and the courier will be used as the background document for further claims and for subsequent refunding of money for Goods and postage. This report, if prepared, will make the claim consideration procedure much sooner and easier and will serve as an evidence of defects and drawbacks described in the report. Upon the report filling, the Buyer must immediately inform the Seller about the problem with the order. In case of problems with the order and upon the report preparation, the Buyer may refuse to receive the goods, to ask for money refunding and to send the goods back to the Seller with the expenses born by the Seller. Pay attention: if the Buyer receives the goods and expresses no complaints with regard to the goods at the time of receipt and with the courier attending, it means that the goods are accepted in terms of quantity, scope of delivery and integrity, and that the Seller’s obligations have been fulfilled completely. From this time, the risk of accidental destruction, damage or loss of goods is fully transferred to the Buyer. The Seller and the courier service shall not accept any complaints with regard to the appearance, integrity and quantity of goods if these complaints were made after the receipt of goods and not recorded in the special form; also, the recording procedure must be attended by a courier and the form must be signed by the same courier. Dear Buyer! To avoid misunderstandings and conflicts, please be attentive during the process of goods receipt and observe all aforementioned recommendations.